Her Excellency Mona Al Marri inaugurates the luxury lifestyle exhibition; Her Excellency Majida Ali Rashid graces the occasion as the guest of honor. Emirati and international designers to showcase their latest collections ahead of Ramadan and Eid. 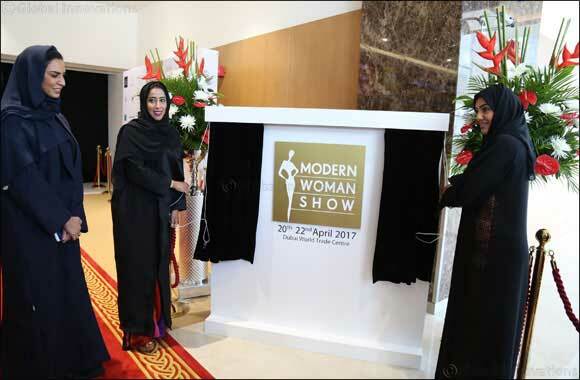 Dubai, UAE, April 20, 2017: The 2nd edition of Dubai’s elite and luxurious exhibition, Modern Woman Show, opened its doors today, featuring over 80 top-of-the-line brands, both local as well as international. Being held at Za’abeel Hall 4, Dubai World Trade Centre, the 3-day event will run until Saturday, April 22nd and is open to visitors from 12 noon – 10 p.m. every day, the entry is free to the show. The premium exhibition was inaugurated by the Chief Guest Her Excellency Mona Al Marri, Director General of Government of Dubai Media Officein the presence of Guest of Honor, Her Excellency Majida Ali Rashid, Assistant Director General and Head of Real Estate Investment Management and Promotion Center, Dubai Land Department; Mr. Adel Al Zarouni, Managing Director and Partnerof Rivoli Group, Ms. Reem Al Zarouni, Emirati entrepreneur &co-organiser of Modern Woman Show along with senior delegates from AW Rostamani,Lootah Perfumesand Sumansa Exhibitions, the organizers of the show. “I feel extremely proud to bring to you yet another successful edition of Modern Woman Show which is all about femininity, luxury, elegance, class, style and sophistication. Artfully fusing local and global fashion flavours, the 2nd edition of our exhibition will present a dazzling array of brands and an exciting, exquisite, chic and haute line-up of Emirati and international designers.The event is an exclusive opportunity to witness the latest fashion and lifestyle trends, yet relax in the calm and comfortable surroundings. Our exhibition is unique at many levels, and I truly believe that there is no other show in Dubai that will give its visitors the sophisticated and luxurious feel that this show does. So expect to be wowed”, said Ms. Reem Al Zarouni. With an impressive lineup of over 80 exhibitors and more than 20 designers, local as well as international, the Modern Woman Show features niche brands, showcasing luxurious and extensive women-wear such as designer abayas, kaftans, jalabiyas, loungewear, evening wear, travelwear, coats, jackets, jumpsuits, gowns, ready-to-wear, dresses and much more alongside the premium artisanal chocolates, handmade jewellery, handbags, home-ware, perfumes, ouds, bakhoor, accessories, shoes among others. The show will also feature on-site beauty sessions on hair, makeup and nail art, fashion shows, product launches and makeovers. Z Haus will be providing complimentary nail art and hairdo services at the event. “We were part of the show last year, when they had just started and the faith we put in the show was rewarding. It is the perfect platform to interact with our target audience and introduce the exquisite scents. The show will help strengthen Lootah’s brand presence among our target audience. People who already know us, will find us there and who never tried our fragrances will have the chance to experience our scents. The show falls in perfect harmony with Lootah- traditional, luxury yet modern and unique. The Modern Woman Show provides people with the opportunity to see and feel some of the world’s most exclusive and niche products under one roof. We are ecstatic to be a part of the show”, said Amaal Mustafa, Branding and Marketing Manager, Lootah Perfumes. AW Rostamani Lifestyle CEO Greig Fowler added: “We are honored to be involved in such a significant event. Here at AW Rostamani Lifestyle, we are committed to the UAE’s retail and fashion sector growth and support the Dubai’s government vision in positioning the emirate as the go-to destination for tourism both at a regional and international level. We are proud to be participating as well as supporting emerging local brands and are looking forward to another successful show this year”. The luxurious brands being exhibited at the show include the likes of A W Rostamani Lifestyle, Lootah Perfumes, Yataghan Jewellery, Kanzi Boutique, Ahmed Al Maghribi Perfumes, Fashion Vault,Kaizer Leather and Accessories, Wed Perfumes etc. whereas the designer lineup includes the popular local names such as HessaFalasi, Latifa Al Shamsi, Saray& Valley, Yasmin Megerisi of House of Meena, Das Collection among many others. Sakina Ahmed, RajdeepRanawat, SunainaKhera, Susan Zhuang, Harry Ibrahim, Hijab Fashion Icon ZH, Ziva Abaya, Bahiya Couture will represent the international labels from India, Indonesia, KSA, South Africa and Bahrain respectively. Dubai Design District and Dubai Design and Fashion Council are the Strategic Partners of Modern Woman Show, while AW Rostamani Lifestyle serves as Diamond Sponsors and Lootah Perfumes as Platinum Sponsor. The Official Airline Partner is Emirates Airlines and Sama Dubai, Al Khaleejiah and B4U Aflam are on board as the TV, Radio and Arab Indo Partners respectively. The event also features Online Beauty Partner Vaniday, Styling Partner Zhaus, Catwalk Partner Shock Talent Management and Indulgence Partner Coco Jalila. Sakina Ahmed is the featured designer, while Sumansa Exhibitions are the organisers.